We made it to the Denpasar airport in time and all got on the plane to Makassar. Everybody is very excited. Once in Makassar we checked-in at the Ibis airport hotel: small rooms but clean and convenient as it's located in the airport. A more posh hotel would have meant a lengthy taxi commute, and we are only here for 6 hours. We left Makassar at 0320 and arrived in Sorong at 0630. Ken Wiedenhoeft was waiting for us. He is a friendly and fit man of 79 from Indiana, USA. In 3 small cars we got to one of Sorong’s government harbors with restricted entry. A speedboat came to pick us up within 20 minutes. Incredible coordination! We hopped on board and headed off to Kri (located on the island of Mansuar, pictured). Right before reaching the Island (at 0900) the boat driver received a phone call from his confused boss. There was a misunderstanding (happens in Indonesia): the other 8 foreigners who were on our Makassar flight were also bound for Kri, and the boat was reserved for them! It explained the suspiciously good timing… No hard feelings on our side: fortune favors the brave! The rest of the day was spent relaxing at the “Raja Ampat Research and Conservation Center” and snorkeling around the amazing blue hole (a submerged crater), right in front of the resort. The food is simple but good and cooked by two adorable, specially-appointed cooks. The ladies sleep in the “scientists' quarters”, a large, air-conditioned room with bunk beds, while JR, WM and I sleep in a small room in the top floor of the building. We boarded the Putiraja (hereafter abbreviated as PR) at noon. It is a most charming Phinisi “live-aboard dive boat”. Ken and Josephine run the show. Josephine is a pretty woman in her late forties with a sweet and secure look in her eyes. She is the captain and the cook and “the everything else”. Ken (pictured) is the supreme handyman, master troubleshooter and, when Josephine is busy in the kitchen helping the cook, he is also the captain. The PR is from the late 80’s and used as cargo ship until 2002 when Ken & Jo purchased and refit it. After 6 years of hard labor it was ready for its maiden voyage. They have been running charters ever since. I met Ken & Jo at Batu Rumah back in 2010 when they were desperately looking for leatherbacks. They are unpretentious and the boat is their home and it feels like that. There are planters with herbs and flowers and it has nothing ostentatious. Inside there are lots of Papuan artifacts. The food is fantastic. (A Posteriori note: one of the crew members caught a tenggiri -Spanish mackerel- which Josephine turned into sashimi. I couldn’t help myself and ate a whole plate of it, thinking, “when will I get the chance to eat my soul of sashimi again?” Four days later and I am still paying the price in the form of rather painful diarrhea). The large table on the front deck is protected by a canvas tarp. This is where we share stories and show our pictures and comment with loud oooohs! and ahhhhhhs! all the beautiful things seen during the day. We arrived at the village of Saporkren, on the Island of Gam towards the end of the afternoon. It is a clean place with a little church, the local institutions and a main sandy street lined with beach almonds under which people are gathered to share stories and sell things such as fruit and the omnipresent bundles of “sirih-pinang” (inflorescence of a Piper sp. vine and Areca/betel nuts, pictured). I asked a girl if Franky Mambrasar lived in the village and she happened to be his daughter. It probably wasn’t a coincidence as everybody had seen the large ship approach the island and anchor off the pier, and everybody knew I was coming for Franky (pictured). He was waiting for me and seemed a little shy. I was happy to finally secure the last missing link of the trip: our bird guide! We had spoken over the phone only once and he had agreed to my terms. Papuans have a strong code of honor and promises are sacred. Franky brought me to the Village chief, Drs Livinus Mambari. He was waiting for me in his “office”, caught in the middle of important business. I greeted him in Bahasa Raja Ampat, using some words Franky had just whispered in my ear which, unfortunately, I have since forgotten. Drs. Mambari remained imperious throughout the meeting causing me to feel a bit uneasy. He looked like a mustachioed bulldog, someone you don’t want to mess with. He had a whole lineup of football trophies on a cupboard behind him so it occurred to me –quite logically- to ask him if he was a boxer. “No” says Livinus with a big smile, “these are football trophies”! “Oh, sorry, I thought you were a boxer or some kind of martial arts champion!” Drs. Mambari seemed extremely pleased with my mistake, laughed out loud and the many other onlookers in the room, on the doorstep and outside laughed too. Someone then made a joke about the mayor’s sexual stamina, which again caused copious amounts or laughter and many nods of approval, all under the satisfied look of my host. This humorous exchange cleared the air. I made a fool of myself, which is the best way to make friends in Indonesia. People love self-derision and foreigners need to come down from their (perceived) pedestal before any laid-back interaction can happen. I agreed to bring him all our paperwork the next day, after our Bird-of-Paradise (hereafter abbreviated as BOP) walk. In the meantime, the other travelers had been brought to shore with the tender. A group of boys, some of them stark naked, were jumping off the pier in unison, doing acrobatic leaps and flips to everyone’s delight. Some of the parents where giving instructions on which stunt had to be performed next to wow their Western audience. Everybody was laughing, the cameras rattled and the sun was slowly sinking in the ocean. We started early, at 0530. We walked 45 minutes to reach a spot on top of a hill and waited there. It rained all night so little chance to see the red BOP (Paradisaea rubra). Everybody was filled with hope though; we were standing under the cover of the trees waiting silently for the red BOP to appear. But the rain kept falling and the birds just didn’t show up. We walked back to Saporkren through a beautiful cemetery consisting of miniature houses, complete with doors and tin roofs (pictured). I visited Drs. Mambari again, to hand him the paperwork and pay our visit tax. He was impressed at how complete my permits were, with a letter from the Raja Ampat police which mysteriously bore, next to the elaborate signature and stamp of Commander Such and Such the misplaced passport picture of our turtle expert, LD. At around 0930 we left for Kabui Bay, which we reached at around noon. I slept through the initial stretch which took us along the Bagan fishermen’s fragile houses built on the rugged slopes of “mushroom” hills. We spent the afternoon touring the maze of karst hills jutting out of the Bay, very much like Wayag. A lot of photography and ooooohs and ahhhhhhs! I flew my drone around the ship and we left at around 1600 for Teluk Aceleok, which we reached at around 0030. The sea was choppy and it was raining cats and dogs. The sound of the dropping anchor woke me and I went up the bridge to look but couldn’t see any sign of life at the end of the bay. Our day started at 0500. We all got in 2 tenders to reach the bottom of the bay where the huts are. It was pitch dark. Standing at the bow of the first tender, I tried to guide our driver Yoris to where I thought the pier was, but got it completely wrong. We managed to stop the boat before hitting some impressive table corals. Yefta, the other boat driver, guided us to safety with his flashlight. We disembarked at the huts and walked inland for about 5 minutes, then sat down on the bank of a small river where Josephine had seen red BOP bathing one early morning a few years ago. On the other side of the river is the immense ficus tree where Jerry and I had spotted a dozen BOP back in 2009 (Gerald Kooyman was my academic adviser at Scripps). Everybody was totally silent. Again, the rain kept us from seeing the red BOP. We did hear the calls of two males (did I tell we saw a few female red BOP at Saporkren?). Before leaving the bay we spotted a palm cockatoo (Probosciger aterrimus), which looked a bit miserable under the rain. It was somewhat of a consolation. We set off at around 0800 for Selpele, at the western tip of Waigeo, to report and then straight on to the Island of Piai, at the edge of Raja Ampat. We arrived at Piai in late afternoon. It is a beautiful, wild speck of land; so small yet such an important part of my life. I boarded a tender with KP and we set off for the Island to see who was at the post. Once on the beach we met Gad, Yusuf’s brother whom I had never met before. He had heard of me, of course. He looks and talks a lot like his older sibling. The rest of the party joined us and I explained everything about the conservation program, the beginnings without a post, the very simple life, the challenges to get the poachers to stop killing turtles, etc. Since the inception of the program in 2006, the number of nests has increased five-fold to reach over 3,800 nests in 2016. We all returned to the ship. Gad and his two assistants ate heartily with us (I know how bad the food is on Piai, the hallucinations of Bali Trattoria pizzas usually kicking in after a week of eating corned beef and rice…) and we all headed back for Piai at 2030. This was a deliberate early start, as the three turtles we saw swimming in the shallows in the late afternoon suggested they’d be in a hurry to nest. The night was magical. Stars and then a moonrise and four huge, green turtles (Chelonia mydas). Everybody got all his/her pictures and for some it was their first encounter with a sea turtle! Mission accomplished. What a relief after the failed BOP missions! We left for Piai at 0630. The group was divided in three: the snorkelers, the birders and the “lazy bums” who wanted to hang out under the trees at the patrol post. I took JR, CBS and AW to the western end of the main beach for a drift-snorkeling session, following the eastward current. 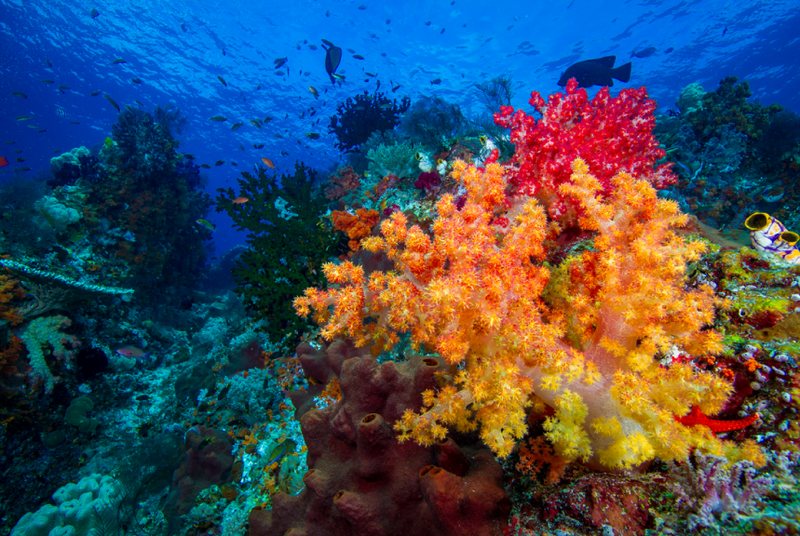 The coral at Piai is impressive. I have seen this place improve so much over the past 11 years. There are now lots of large reef fish, turtles and sharks. My travelers were absolutely delighted. 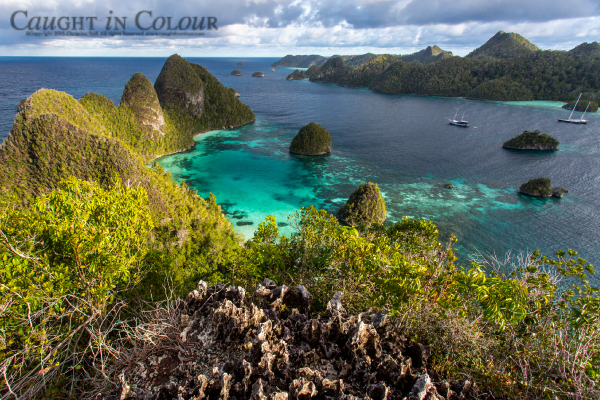 This is Raja Ampat in its full splendor, except that very few people have been to Piai, which makes it even more special. The birding group came back a little disappointed, they didn’t see much. They may have started too late (around 0700) or maybe the trees aren’t fruiting? After saying goodbye to Gad and his assistants, we all got back to the ship. At 1000 we were steaming towards Wayag. We reached Wayag at 1300. It never stops to amaze me. It is absolutely stunning. Barely had the Putiraja cast anchor when I jumped into the calm blue waters of the lagoon. Within a few minutes CBS, JR and KP joined me. We bobbed around for a while, soaking in the beauty of the landscape then set off with the rest of the group in the tenders for a snorkel at one of my favorite spots: the shoreline at the entrance of the lagoon. Here stands a large swath of incredibly delicate staghorn coral which at low tide can be completely exposed. It’s then a little tricky to maneuver your legs within the shallow channels without breaking the extremely fragile coral arms. Five years ago I snorkeled here with Liz on our first trip to Papua together. 0630. Filled with enthusiasm a small group consisting of JR, CB, CBS, JS and JC set off to conquer Mount Wayag (for want of a better name). The rugged path was quite impressive for it was extremely steep: an almost vertical climb but on very solid, razor sharp limestone with good footholds and lots of roots to hold on to. I was a little anxious as CB has bad feet needing an operation soon, and other climbers felt a little insecure about their sense of balance. I was climbing right behind JC and directed her step by step, giving her words of encouragement. I think she wondered why on Earth she decided to come along on this climb. When we reached the top it was crystal clear the reward was worth a thousand ascents! What an incredible view! I had my drone and did two flights. I think I shot some of my best footage so far. My little Phantom performed perfectly, despite the strong southern wind. There was no takeoff or landing spot, so JR held the drone up above his head, releasing it on command. The climb down was very, very slow. Yoris, Yefta and Franky were of great help, making sure the other climbers made it back safely while I helped JC. During a challenging, almost vertical section she suddenly cried out: “Oh look! A bee-eater!” That’s when you know you are dealing with a die-hard birder. When she was safe and sound on the beach she was beaming and gave me a kiss on the cheek. It is rewarding to see friends overcome challenges and surprise themselves with feats of this kind. During the two hours of our adventure on the mountain the wind had picked up and generated a considerable swell which was now heaving the Putiraja’s stern up and down. The launch plank was moving dangerously with the strong seas. I managed to time my jump from the tender and landed well, but I didn’t want my friends to take unnecessary risks. I told Ken we had to find another solution. We lifted anchor and met the tender at a protected spot some 20 minutes later. At around 1000, after everyone was safely on board, we continued our way. Josephine decided that given the chance of more rainfall we would not attempt another stop at Aceleok Bay to see the red BOP. Instead, she proposed to sail straight to the Bird’s Head Peninsula. It sounded like the wisest thing to do, despite the fact we could miss Ricardo at Jamursba Medi if we arrived one day ahead of schedule. I sent him an email via Liz (the Putiraja has satellite internet) to let him know of this change. We arrived at Batu Rumah in the early afternoon. We’d done 6-7 knots on average, against the prevailing currents. I had forgotten how incredibly wild the coastline is. There are several layers of very steep mountains, the tallest ones in the back are grey and disappear in the mist. The slender, white strips of distant waterfalls contrast against the dark green jungle. Closer to shore, giant trees with giant vines give an impression of absolute impenetrability (an illusion, as the understory of a mature rainforest is as clear and open as a Victorian park), of Nature’s dominance over everything else, especially our little ship. Suddenly, delicate creatures emerge from this other world: a pair of Blyth’s hornbills (or Papuan hornbill; Rhyticeros plicatus) flying from tree to tree. Standing at the bow of the Putiraja, I could make out the beach at Batu Rumah, the “house rock” (pictured) where I had spent many months for my fieldwork. Tucked into the trees behind, a faint trace of humanity: the decaying roof of the WWF post, which until recently was one of the most ostentatious buildings on the Bird’s Head Peninsula (pictured). I was very excited to go ashore. Franky, LD and JR came along. When we reached the post, my UNIPA friends were there: Gideon, Ricky, Sadrak and Petrus (pictured). We were all very happy to meet again. Ricardo hadn’t arrived yet, but was thought to be on his way from Manokwari. A new development at Jamursba Medi is that the owners of the land are allowing professional hunters in the forest. One of their camps is located right across the estuary. We went there and observed three wild-looking men skin a deer and roast a large tree kangaroo (pictured). None of them looked particularly engaging. Locals are oftentimes shier than visitors. I haven’t figured out yet if, overall, things at Jamursba are improving or deteriorating. When the other travelers reached terra firma I took them to the UNIPA post, then to the forest behind it, which is the habitat of a large population of Priam’s birdwing butterflies (Ornithoptera priamus). They are truly amazing and so numerous! The females don’t possess the males’ iridescent green color but are nonetheless beautiful and twice the size. They flutter close to the forest floor, lightly brushing the underside of leaves: each time they do this, they deposit a minuscule pink egg. Males join in the dance and mate whenever they can. Rays of light penetrating the thick canopy are like disco strobes when they hit the birdwings’ green scales. When the eggs hatch, the caterpillars travel to a nearby Aristolochia tagala vine, their host plant. For the next 30 days they gorge themselves on Aristolochia leaves to reach an impressive size. The shiny black caterpillars measure up to 15 cm in length and have numerous orange spikes on their backs. Once mature, they metamorphose into chrysalises which in turn grow and pulsate for another 30 days before delivering the final product: a new birdwing. After watching the butterflies we walked along the beach towards Warmamedi. It was my intention to show everybody what to expect that night, as the path can be tricky with exposed rocks to climb over at high tide. We saw at least 12 Blyth’s hornbills (pictured). The mountain face covered in the thickest of vegetation is almost vertical. Here and there imposing gullies of rocks and sediment have flowed down to the beach. Failures are common, especially during heavy rains and earthquakes. A high peak, visible from the camp, was cut in half during the 2007 quake, exposing dark red bedrock. The beach of Pasir Pendek, which used to be a crescent-shaped bay back in 2012 has been completely replenished with sand and is indistinguishable from its neighbor, Warmamedi. There are lots of turtle tracks, of hawksbills (Eretmochelys imbricata), greens, olive ridleys (Lepidochelys olivacea) and leatherbacks (Dermochelys coriacea). The latter are so large they look as if tractors were driven straight out of the ocean (pictured). It was time to return to the camp but CB, JC and LD decided to stay behind with Franky. The rest of us ate on the ship and, at around 2000, set off for Warmamedi again. At Pasir Pendek we came across a nesting green turtle. We didn’t stay long with her and continued to Warmamedi. Every night the UNIPA boys patrol the entire length of the beach (22 km). They agreed to signal us the presence of turtles by flashing their headlamps. After a while, some of us got a little cold and impatient so we started walking to warm up our limbs. I couldn’t help but think of the possibility of not seeing turtles, and of how disappointing that would be for everyone. It was already past 0100 when we saw flashes at the other end of the beach: the signal we’d been waiting for! We walked back swiftly for about 25 minutes, me leading the way, when I stumbled upon the first leatherback track. It was humongous. The turtle had just emerged and was resting at the crest of the beach. It’s a delicate stage in the nesting process because the animal is still scouting the area and is very alert to danger. Any sudden movement could scare her back to sea. I warned the others who were coming behind me to turn off their red lights and walk down to the waterline. We were all gob-smacked by the sheer size of the turtle. I ran ahead to warn the other group. Interestingly, no one remembered flashing their headlamps; they hadn’t seen any turtles. We all waited and marveled until the leatherback was finished nesting. CB and JR then start taking pictures. We had discussed the ethics of using flash photography and decided that only the professionals could take photos from the front of the turtle. The reason we did this was because I felt some really good leatherback shots could help promote conservation and fund-raising for the Jamursba project. I was aware that the immediate effect could be slightly detrimental to one single turtle (which nested successfully and eventually returned to sea) but in the long run, the pictures may allow raising enough money for UNIPA to hire more staff. Elated (and me relieved!) we returned to the Putiraja. I felt my mission was accomplished. Some of the travelers said seeing the leatherback was their highlight and if it were up to them they could go back to Australia perfectly content. An even "better" option voiced by others, was that they’d rather stay at Jamursba while the rest of us sailed on to Cendrawasih Bay... I went to bed and fell asleep like a rock. It is a pretty intense and rewardingjob that of leading a trip like this. We started very early this morning, at around 0530. I slept 3 hours and was up again to go ashore with CB, LD, JC and JR for a forest walk. The goal was to see the lesser bird-of-paradise (Paradisaea minor). Yan Yessa (pictured) was at the camp and took us on the path that starts behind the old WWF kitchen. Because the area is in disuse he had to chop his way through rattan vines –the nastiest spines I can think of- with a very sharp machete. We had our best cameras with long lenses and our hopes were high. The forest comes to life just before dawn and is filled with the most exotic animal sounds: hornbills that swoosh overhead, barking deer sounding the alarm and, of course, the complete registry of calls of the male BOP. It’s the day-shift on the Bird’s Head Peninsula. We saw a scrub wallaby (or pademelon; Thylogale sp.) and a herd of red muntjac (or barking deer; Muntiacus muntjak) before reaching the BOP display trees. The BOP calls could be heard all around and we caught fleeting glimpses of the birds flying swiftly from one branch to the other, never staying longer than 10 seconds in place. A very difficult photographic endeavor, for by the time you’ve located the bird in the viewfinder it’s already gone! We kept trying but the birds were, despite their proximity, painfully out of reach. What is needed is a tower in the middle of the display trees where you can hide and see them at a level height. We continued on our walk until we reached the river. It was slow going as we had to climb up and down embankments. "Photographers’ urge" further slowed down our progress. We managed to shoot a beautiful western crowned pigeon (Goura cristata; pictured). At every new meander of the river we surprised wildlife. A herd of barking deer kept running away from us; the alarm-sounder giving a single loud bark prompting everyone to flee in a great stampede to the safety of the next meander where we would meet again a few minutes later. We made it back to the ship at around 1000 for a rest, and a 1700 we were readying ourselves for another night with the leatherbacks. Some of yesterday’s walkers decided to go to the UNIPA camp but not to Warmamedi. The UNIPA guys set up an open air cinema. Ken’s little projector, hooked up to a small laptop powered by UNIPA’s stinky and noisy generator, was used to show documentaries on conservation in Raja Ampat (featuring Mark Erdmann and Andy Miners from Misool Eco Resort) and about Birds-of-Paradise. Everybody was sitting on makeshift benches and a large tarp under the trees. The screen, a white bedsheet from the Putiraja, was attached to the wooden façade of the post. The UNIPA boys brought cookies and tea with only 6 glasses, pretty much the only stuff left as they were waiting for Ricardo’s supply vessel with its boon of fruit and canned food. I had hoped Ricardo would show up to give us a presentation about his work but he didn’t make it to Jamursba Medi that night. Josephine brought our dinners in plastic boxes and when I asked everybody to set a little bit of food aside for our UNIPA friends, 6 of the travelers donated their entire meals. CB, CBS, LD, Franky, Yan and I set off for Warmamedi at around 2200. Petrus and Ricky would come later. CB was limping badly but not complaining and refused my offers to help her carry her photographic equipment. I am very impressed at her grit, as well as CBS’s positive attitude. LD, who is the real “turtler ” of the group, is also a trooper. We met our first leatherback at Pasir Pendek, the beautiful beach we visited with Liz and Hester and where Liz did a backflip from a big rock in the sea (I was very impressed, I’ve never been able to do backflips!). The trees in the background were lit up by thousands of pulsating fireflies in an apparent Christmas rehearsal. It is a very difficult scene to describe with words, nature is too dense and powerful and only your eyes and your senses can generate the most accurate and honest feelings. We sat there for a while before the UNIPA group, Josephine and some crew members showed up. We then moved to Warmamedi, the next beach, and walked a few hundred meters before CB and I sat down. She was utterly exhausted and in pain but didn’t utter a word of complaint. LD, CBS and Franky carried on. The goal of the night was to get pictures of the egg-laying process. Two more turtles came up but didn’t nest. CB got a few more shots of the turtles returning to the water before we decided to call it a night. It was very dark and we walked back slowly. When back on the ship I fell into a deep, dreamless sleep and forgot to tell Josephine to hold off our departure until Ricardo’s arrival. When I woke up, we were already far from Batu Rumah. The PR lifted anchor at around 0430 but I didn’t wake up before 0600. When I got onto the main deck I realized we were in front of the village of Saubeba. It took me a few minutes to adjust to this change of schedule. I still thought I needed Ricardo to facilitate my meeting with the owner of the land, Pak Martinus Yessa. I sent Yoris, the boat driver, back to Batu Rumah on the faster of the two tenders to see if Ricky had arrived and to offer him a ride to Saubeba to meet me. An hour and a half later he was back saying there was no sign of him at the camp. Ken and Jomade the right call: leaving Jamursba early was the most efficient thing to do. Yoris took Franky and I to the village. Yan Yessa, the man who took us on the forest walk yesterday, had prepared the ground for our arrival; people were expecting us. Saubeba has changed for the worst. There is less money since the Akram gold mine closed, supposedly because of the Bupati’s (Regent) refusal to grant a permit. Men are unemployed, the school is run down (which always makes me sad) but old friends are still there and were genuinely happy to see me. I sat down to talk to Pak Martinus. He is the de-facto leader of the village. I understand the high price asked from UNIPA to patrol the beaches (Rp. 60 million for 3 months, or USD 4,500), in effect a payment for the “privilege” to protect the turtles, is because the village is in dire straits and Martinus helps his neighbors and extended family survive. He can’t be too corrupt or greedy as his house is as humble as anyone else’s. I recognized a teenage boy who looked at me with a shy smile: Titus, one of my little friends from my early days at Jamursba. I used to go fishing with him and Roberth, and checking his pig traps in the forest. He wasn’t as smart as his friend (who is now studying at the university in Java, with a fellowship!) but was always a really nice kid. Titus was happy to see me and took the rest of the group, who had just disembarked, to visit his village (picture of the run-down school). I told my friends of Saubeba’s misfortune; its uncertain position between hunting-gathering and modern life, the latter stubbornly refusing to take it on its bandwagon… I felt sad about the gold mine, but also happy it finally shut down. Ibu Agusta, from the house at Wembrak, made nice nokens (bags) for the ship’s travelers, but there were only four of them! I asked Martinus how much she wanted for one (Agusta wasn’t in the village) and he suggested Rp. 100,000. I replied she should get Rp. 200,000 (USD 15). The nokens sold in 30 seconds and the lady who received the money (her daughter?) was amazed at how quickly they changed hands. If only they’d made more! I hope other ships will come to purchase handicrafts. It all hinges on tourism, the lesser evil; yet, I am happy we are the only tourists! We all boarded the ship at around noon and set off for Manokwari. I hoped to see Ricky but when we passed the “house rock” there was still no sign of his boat. Through the binoculars I could see the modified “Sand Fly”, my “formerly inflatable” speedboat with 4 of the 5 UNIPA boys on it, floating near shore. They were yanking on the engine’s starter cord. They reached us a few minutes later to say that Ricky was on his way and coming in from the east, and that we would certainly meet him as we were traveling in the opposite direction. A crew member woke me up an hour later: Ricky was about to board the Putiraja. He hasn’t changed much and we were very happy to meet again. He brought his two teenage daughters and his little son, Daniel, who was particularly excited to be on board a real ship. Ricky gave us a nice run-through of his conservation program and the many challenges, among which the low hatching success of the leatherback nests and the everlasting funding issues. Everybody listened attentively; they have become aware of the complexities of conservation in Papua. Josephine ushered the visitors off the ship as she was anxious to reach Manokwari where she wanted to buy supplies. It doesn’t seem that essential to me; in my opinion it’ll take away precious whale shark time. We reached Manokwari at about 0800. Josephine went ashore and came back 4 hours later. I was a little bummed at the loss of time, but it seemed necessary. We then sailed due south to the bottom of Cendrawasih Bay. We should have reached Kwatisore in the early morning, but winds and currents were unfavorable. It is a long, long way down the bay. The sharks better be there to greet us! We finally anchored at 1300 under a deep blue sky. At that time of day it is steaming hot under the tarp that covers the front deck. We are sitting in front of a small resort which is run by an Ambonese man, the only one of its kind in this immense bay. Just out of view there’s the village of Kwatisore. There are Bagans here and there but I was told that because of Lebaran (Muslim holiday marking the end of Ramadan), most fishermen have gone home to Makassar. Will this impact our chances of seeing whale sharks? We all boarded the two tenders. Our driver Yoris took us to the closest Bagan. I was the first one in the water and pretty anxious... The water here is of a beautiful cerulean blue, and long white dancing rays of light dart towards the bottom. We all swam around the Bagan several times but in vain; there were no sharks around. I know that in the business of finding wildlife patience and optimism are the best weapons. We didn’t have to wait long, for after just an hour Josephine returned with the other tender and told us five sharks had been spotted at another Bagan. We immediately climbed on the boats and set off to the new spot. What a sight! Before our tenders had come to a halt we could see the dorsal fins of several sharks. The sea was boiling around the offal thrown in the water by the fishermen. I couldn’t jump in fast enough and almost landed on top of a whale shark! Looking down on them from very close they seem like slow-moving trains. I estimate their length at 5 to 6 meters. Some of them carry satellite transmitters bolted onto their dorsal fins, others show obvious propeller injuries. As the sharks, which are for the most part juvenile males, reliably return to the same area (but to different Bagans), researchers are confident they will encounter the tags, which by then are covered in barnacles and other marine life, to detach them from the sharks (the tags can then be sent back to the manufacturer to be refurbished). Almost everybody jumped in the water and I could hear the screams of delight echoing through my friends’ snorkels. Normal protocol stipulates humans should not get any closer than three meters from whale sharks. But in Cendrawasih Bay the rule is hard to follow as it isn’t the diver who goes to the shark but the other way round! While I was filming a shark from the indicated distance I suddenly felt a strong jolt, a push against the small of my back. When I turned around all I could see was the open mouth of a shark that was trying to get to the food but found me on his way. It was a real pleasure to see everyone so delighted. Gone was the boredom of the long uneventful transit down the Bay… I saw that BVS sitting alone on the tender. I swam over and asked her if she had been in the water. She was scared. I summoned her to put on her gear, pulled her off the boat and, taking her hand, led her towards the Bagan. I left her in between four friendly giants… At first, her screams of sheer terror echoed through her snorkel but she quickly settled down and stayed in the middle of the feeding frenzy. Later, she thanked me for pushing her over the ledge. That night CB, JR and I went back to the Bagan. It was a magical experience. Bagans are clever light traps. I had seen them many times in the past without understanding how they really work. They consist of a square grid of about 25x25m made with strong bamboo poles that’s mounted on a single wooden ship. Thick ropes connect the four corners to heavy anchors which keep the Bagan level and stable. It is therefore a semi-permanent contraption, moved around seasonally on select days when seas are at their calmest. In the middle of the grid above the hull, there is a small platform on which sits a well-built wooden hut. 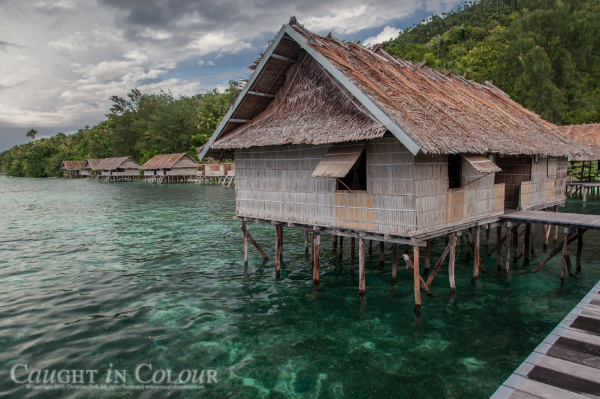 Inside it’s tidy and painted white, and there is a mat on the floor on which the five fishermen gather to eat, drink tea, sleep and watch Indonesian thrillers on a large-screen TV. For those with a delicate back, fish nets are hung between the bamboo beams outside. It is an eerie feeling to lie suspended above the lift-net (pictured). There is also a powerful sound system and everywhere there are light bulbs. A complicated switchboard inside the hut connected to a large diesel generator suggests electricity is a key component of a Bagan. The fishermen are young and friendly and very happy to have us around. Josephine made a deal with them: they should feed the whale sharks around the clock to ensure they stick around for the length of our stay. Here one can think of the unnatural situation (on the premise that humans aren’t part of the natural environment) of whale sharks being fed dead by-catch (as slow-moving plankton specialists they would have a hard time feeding on live fish). I can imagine the recurrent question researchers, who take advantage of this unique opportunity to study them, face when presenting their findings to their peers: “the behavior you describe is not representative of a wild animal”. It’s an argument that’s difficult to counter. Yet, Cendrawasih Bay offers unparalleled access to these largest of fish, so any new insight on migratory behavior is better than no insight and it is also a test bed for new tracking techniques. The Bagan’s bamboo frame is lined with light bulbs spaced one meter from each other. When at the beginning of the night all lights are on, the Bay seems littered with bright stars floating on the surface of its black waters. Fish are attracted from far away and converge to the treacherous Bagans. When enough fish have gathered, the chief fisherman turns off the outer line of lights. The fish aggregate a little closer and are now underneath the bamboo structure, which is now lit from a smaller square area all the way to the center (pictured). This stage lasts another hour. The final act consists in leaving on one single very bright light underneath the central platform. The bulb hangs close to the waterline and is contained within a tunnel of thick carpet that hangs like a curtain, its lower end touching the water. No light escapes through the sides, there’s only a single powerful beam that shines straight down. A thick, whirling cloud of confused fish congregates around the apparent safety of the central beam: it’s time for the kill. The fishermen swiftly pull up the lift-net that’s hanging underneath the unsuspecting catch, tying it up in sections to the frame with a clever knot. Working their way from the outer edges to the center, they concentrate the fish into a single pocket of the net. I counted five to six different species of silver fish which were scooped up with dip nets and sorted by type into ice boxes. Everything goes fast and the most remarkable thing is that the whale sharks only show up at this final stage. They have learned over the years that this is when they get the leftovers: anchovies and a few other species that don’t sell at the fish market of Nabire are tossed straight into their eager mouths. Since tourists started coming to the Bay less than 10 years ago, this relationship has become mutually beneficial as fishermen earn additional income from visiting ships. It is a strong illustration of the virtues of tourism when well managed. The boys on the Bagan are truly fond of the sharks, and vice versa. July 1st. This morning JC came back from her early morning birding trip with a huge smile on her face. She saw birds-of-paradise! She commented: “at the age of 68, I am now complete!” I am very happy for her. For the rest of the day she couldn’t shake off that smile. We all went back to the Bagan. The fishermen had caught a whale shark overnight. I am not sure if it was by accident or a perk to please us. I hope the former. The animal was lying motionless on its belly in a pocket of the net and was breathing slowly. The fisherman explained it had been eating fish until the wee hours and, completely satiated, fell asleep. I believed him as when I swam to have a close look at the animal it seemed totally relaxed. Later, when they were untying the knots off the frame of the Bagan and the net was loosening up around the fish, it started moving to and fro, slowly at first but then when it felt the net wasn’t holding it back anymore it became more agitated. Once its head was clear it swam out with a few powerful strokes of its tail. It's good I wasn't in its way! Afternoon: Ken offered JR and me to dive with the whale sharks. The water wasn’t very clear; I like the snorkeling better. I shot some more drone videos, of the PR surrounded by whale sharks, but it was difficult to get them all in the same frame. Flying has been tricky on this trip, because of the numerous cables around the ship and the lack of proper take-off and landing spots, for instance at Wayag. A take-off assistant is essential in many cases. Later in the evening, after the table on the front deck was cleared I gave my last presentation, on leatherback hatchling dispersal, my PhD work at Scripps. We left at 0600 for the BOP site, deep into the mangroves. The landing spot is beautiful, the sea calm as a lake and there is coral all around. We went through a natural tunnel among the mangrove and left the boats. The first part of the walk is on planks balanced on logs, to avoid walking in the muddy water. I found walking besides the planks easier; sometimes the cure is worse than the disease! The end of the path is at the foot of a hill. It was getting darker as a rainstorm was approaching. We hoped it’d spare us in order to break the “Paradise Curse” which has pursued us on this trip (though LD, CBS and JC saw the BOPs in excellent conditions yesterday). The hike was in a beautiful jungle and easy as long as the ground was dry. Everyone followed behind. When we reached the lookout we could hear the Lesser BOPs and got a glimpse of a fluffy tail up in the display tree. But right then it started to pour, and really pour. We were cursed! Our guides ushered us to a rain shelter under which we all huddled for the next 30 minutes, until the palms on the roof were so thoroughly saturated water started cascading through. It was time to leave as some of us were falling because the ground was turning into slippery mud. Only the hard-core birders (such as JC, who did not come today) and photographers (CB and JR) are likely to hang on under these conditions. We left the shelter a little bummed out and headed back up the hill. A few moments later, as we were standing in view of the display tree, the rain stopped . JR, and CB were ready with their cameras but the rest of the group was looking at me, expecting to leave. Above us, we heard the cacophony of the male BOPs who were heading back for their morning dance. I had to make a decision as the group was now divided and I couldn’t expect the non-birders to be patient for something they obviously were not thrilled about anymore. I asked Yoris to take the non-birders back to the boats and promised them we’d be joining them shortly. A mere instant after they left, four birds of paradise started dancing, vibrating their puffed-up yellow and white tail feathers. Females joined the fray jumping swiftly from one branch to the other to inspect and evaluate each of the males. I let JR and CB shoot the birds on the main display tree and waited under an “overflow spot” where males too excited to parade with the others can do a little solo dance to "cool off". Every time that happened I would have wonderful views of the entire birds, with their metallic green throats and dark red chests. But they never stayed longer than 10 seconds on one spot. It was evident that in the BOP world this daily ceremony is a big deal and requires 100% focus and commitment. We didn’t seem to bother them but Franky clearly instructed us not to use our flashes lest we would scare them away. CB and JR were thrilled, judging by the hushed “wows” and rattling camera shutters. After a while I had to tell them to head back; they would have stayed many more hours. We returned to the boat landing, very satisfied to have waited that extra minute, literally! 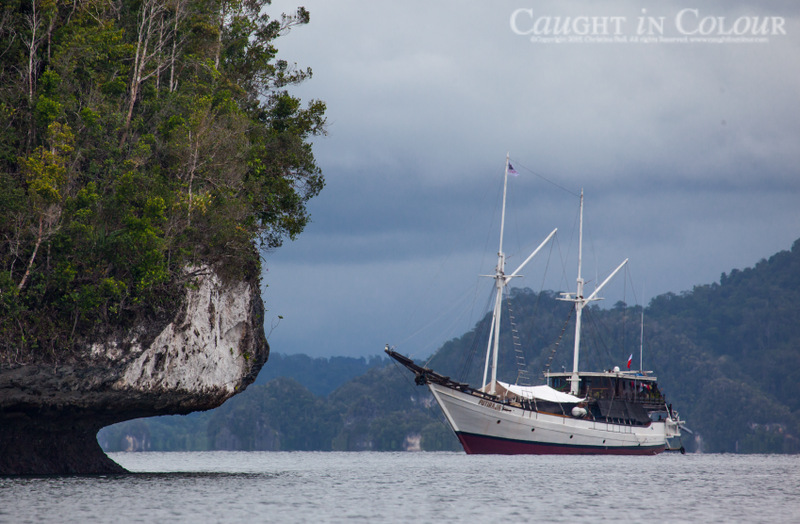 After all parties were back, the PR lifted anchor and started its long voyage north towards Manokwari and then Sorong. We reached Manokwari at about 1000, after 26 hours of sailing. We anchored off the leeward side of Mansinam Island. Currents were favorable going north, cutting 1 hour from our ETA. We saw a tremendous thunderstorm last night and were happy it was happening far away. We were all gathered on the two decks, drinking beers and Amarula liqueur brought from Africa by BVS. A very good vibe, everybody seemed happy and friendly with each other, despite inevitable differences in character. On a ship you either learn to cohabit or you don’t. If you don’t, it gets miserable quickly as there is no escape. I think we all had the wisdom to be flexible. Upon arrival in Manokwari, Josephine left the ship with Kataro, her assistant, who had to catch a plane. Because we had a few hours to kill, I left the ship with JS to see the monument to the missionaries. It is a pretty imposing building: a tall, square metallic structure similar to a French farm stable with thin steel beams and a corrugated iron roof that probably doubles as a detachable sail during strong winds. Underneath, there is a concrete stage with two Virgin Mary sculptures in the middle. Between the copper sculptures which, judging by their noble dark-red patina, are weathered by years of exposure to the elements, stands a massive 3-D crucifix of stainless steel with Christmas lights around the edges to make it visible at night from all corners of Manokwari. Spanning the length of the back wall is a bas-relief panel of the same style and material as the Virgin Marys. It depicts the glorious story of Papua’s first two missionaries who landed at this same spot in 1855 (ironically, only a few years later, A.R. Wallace reached nearby Waigeo, where many of his ideas on species distribution matured into a heretical theory of evolution). The two German fellows were sent by the Dutch reformed church to convert the inhabitants of New Guinea to Christianity, a necessary task no one had bothered (or dared) to undertake. It was a cunning move by the Dutch: because there was a reasonable chance these pioneers of Christ would get killed and eaten straight upon arrival, it made sense to first send non-Dutch missionaries. You never know. Instead of meeting a dreadful fate, FF Ottow and Geissler managed to inculcate proper moral values in the people of Manokwari, who, as the panel beautifully depicts, swiftly deposed their weapons and fell to their knees in submission. Outside the building there are four life-sized statues of the missionaries. They look steadfast and serene but one of them is missing a hand. I searched for it in the grass but it was nowhere to be found. I discovered something else, though, thanks to Father Ottow’s maimed extremity: all the monument’s copper artwork is in fact skillfully painted polyester resin. This anti-materialist statement seems all the more powerful given that World’s third largest copper mine is only a few hundred kilometers away. When news reached the colonial authorities that both missionaries had survived and were thriving in their new outpost , the Dutch Church decided to send its own countrymen to complete the noble task of reforming the savage land. Trash is omnipresent on Mansinam, quite unfortunately as it’s a beautiful, lush island. Locals couldn’t bother less, it seems. A case in point: the edgings around the palm trees. Where in some places a gardener would use stones or evenly-sized blocks of coral, the edgings are here made of matching plastic bottles. One tree has a neat circle of red Valvoline oil containers stuck upright in the sand... It is interesting how much we humans can differ in taste and opinion. At noon we set off for Sorong. The weather forecast is good off the Bird’s Head, we should have calm seas. Evening. Josephine spoiled us for our last meal: a ragout of calamari and shrimp, organic rice, vegetable soup and bean curd curry with a variety of delicious sambals (sambal terasi and sambal Bali). She served us fresh tamarillo juice and for desert, very decadent Oreo ice cream. She has done an astounding job on this trip, always maintaining the highest standards of quality. This is really a feat, as on most cruises after a week fresh produce stops being fresh, and cooks turn to canned food. Our favorite Chef and Captain is a great organizer, she takes advantage of every little opportunity to go ashore to purchase local specialties. This is how she treated us to delicious papaya flower salads, pisang goreng from bananas sourced in Saporkren and perfect passion fruit from Manokwari.